As with most parts of the body, traumatic effects in the forearm or wrist may occur abruptly (eg, fracture, strain, sprain) or be the result of long-term microtrauma (eg, tunnel syndromes, arthritis, entrapment by scar tissue). Restriction in pronation suggests a disorder at the elbow, radioulnar articulation of the wrist, or within the forearm. Restriction in supination is associated with a disorder of the elbow or radioulnar articulation of the wrist. Thickened tissues may cause compression symptoms. A palpable nontender ganglion may be found on either the dorsal or volar aspect of the wrist, perceived as a pea-size or slightly larger jelly-like cyst. Tenderness over the medial collateral ligament, which rises from the medial epicondyle, is a sign of valgus sprain. Muscle tenderness in the wrist flexor-extensor group is characteristic of flexor-pronator strain (eg, tennis, screwdriving motions). Tender, possibly taut, wrist extensors on the lateral aspect are often associated with tennis elbow. Tenderness in the first tunnel on the radial side is a common site for stenosing tenosynovitis associated with a positive Finkelstein's sign. It is also important to check for rupture of the tendon in the third tunnel, often resulting from a healed Collie's fracture defect at the dorsal radial tubercle or arthritis causing tendon wearing. Pain, tenderness, and swelling about the ulnar styloid process suggest a Colles' fracture or a local pathology such as arthritic erosion. It's good procedure to check the easily fractured scaphoid by sliding it from under the radial styloid with ulnar deviation of the wrist. Many examiners radial deviate the wrist and check the triquetrum, a common site of fracture. Tenderness in the 5th or 6th tunnel is characteristic of synovitis, dorsal carpal subluxation, dislocation of the ulnar head, or rheumatoid arthritis. An inflamed nerve is always tender. Nerve injury is often secondary to epicondylar fracture or severe trauma. Note any atrophy of the thenar (eg, median nerve compression) or hypothenar eminence (eg, ulnar nerve compression). A simple handshake can be very revealing. The alert diagnostician will have a habit of greeting the patient new to the practice with an appropriate handshake. The weak grip of the myopathic, the cool damp hand of the thyroid patient, the stains of paint on house painters (eg, potential chemical, abrasive, or lead poisoning), the stiff callused hands of the laborer, the flattened and callused fingertips of the violinist, and the worn fingers of the tailor, for example, may reveal much to complete the patient's later profile. The nervous, limp, or hearty handshake also reflects the patient's current temperament. The "claw hand" of nerve palsy, the "flipper hand" caused by contractures, and the spastic "hemiplegic hand" of the stroke victim are important diagnostic clues gained solely by observation. Besides posttraumatic deformity, hypertrophic osteoarthropathy is a common deformity seen in the wrist. It is not traumatic in origin. It's usually a distal manifestation of chronic pulmonary or pleural disease featuring enlarged distal ends of the radius and ulnar and prominent finger clubbing. It is readily recognized by inspection and confirmed by roentgenography. Bronchiectasis, tuberculosis, and empyema are common causes. In Allen's test, the sitting patient elevates his arm and is instructed to make a tight fist to express blood from his palm. The examiner occludes the radial and ulnar arteries proximal to the wrist by finger pressure. The patient then lowers the hand and relaxes the fist, and the examiner releases the arteries one at a time. Some examiners prefer to test the radial and ulnar arteries individually in two tests. The sign is negative if the pale skin of the palm flushes immediately when the artery is released. The sign is positive if the skin of the palm remains blanched for more than 3 seconds. The patient should not hyperextend the palm as this will constrict skin capillaries and render a false positive sign. Allen's test, which should be performed before Wright's test, is significant in vascular occlusion at or distal to the wrist of the artery tested. When possible, uncomplicated low-forearm fractures and dislocations should be aided somewhat on-field by steady axial traction. Motor and sensory function of the hand should be assessed, and circulation noted by capillary filling of the fingernails upon finger pressure. Then pad, splint in the position of function, and refer. Roentgenography is required to analyze possible complications prior to considered reduction. Lateral and P-A x-ray views are standard, but several degrees of obliquity are often necessary. Comparison should be made with views of the contralateral (uninjured) arm. The ulna is usually displaced posteriorly when the distal ulna is subluxated. In radial or ulnar fractures, ulnar rotational abnormalities may be a complication. Malposition of the bicipital tubercle proximally and the ulnar styloid distally are helpful clues to rotational abnormalities. The bulk of forearm bone injuries is from falls or direct blows. When a midarm blow fractures the radius or ulna, both ends of each bone must be evaluated for possibly associated subluxation, dislocation, and rotational abnormality. Fractures of the bones in the forearm usually involve both bones. Sometimes, however, these bones do not fracture at the same level. Recall that dislocation of the proximal radius accompanies midulna fracture in Monteggia injury, while midradius fracture is accompanied by distal ulnar subluxation in the Galeazzi fracture. When a potential fracture of the distal radius is difficult to view on film, careful inspection of the pronator muscle fat pad should be made just proximal to the wrist. It may be the only radiologic sign present. This fat pad, which separates the pronator quadratus muscle and tendons of the flexor digitorum profundus, is normally viewed on lateral films of the wrist. Blurring, bowing, or obliteration of the pad may be seen as a consequence of injury or disease of the radius or volar soft tissues. Fracture of the distal radius (Colles') is the first consideration in wrist injuries, but the close relationship of forearm and wrist bones must be examined. The joint spaces between the carpals are normally uniform. Epiphyseal fractures and fractures through the growth plate with or without shifting are not uncommon in youth. The typical deformity in this injury is a compression of the posterior margin of the radius. The result is a backward tilt of the anterior surface as viewed in the lateral view. The articular margin of the radius will be disturbed, and the distal radius may be fragmented and impacted. Old fractures are differentiated from recent ones by the presence of rarefaction and the absence of a distinct fracture line. On a P-A view, disruption of the distal radio-ulnar articulation is seen as joint widening or narrowing. During an impacted fracture of the radius, bone fragments are frequently telescoped and both styloid processes are seen at the same but more distal level; ie, the radial styloid is normally seen a centimeter distal to the ulnar styloid process. The radiocarpal articulation should also be carefully evaluated on the lateral view. The radial longitudinal axis normally extends through the lunate's midpoint. Any carpal may be a potential fracture or dislocation site. In order of frequency, the bones usually involved are the scaphoid, lunate, and capitate, all which may be associated with injuries of the radius or ulna. Of the carpals, the lunate is the most frequently dislocated; the scaphoid is the most frequently fractured. 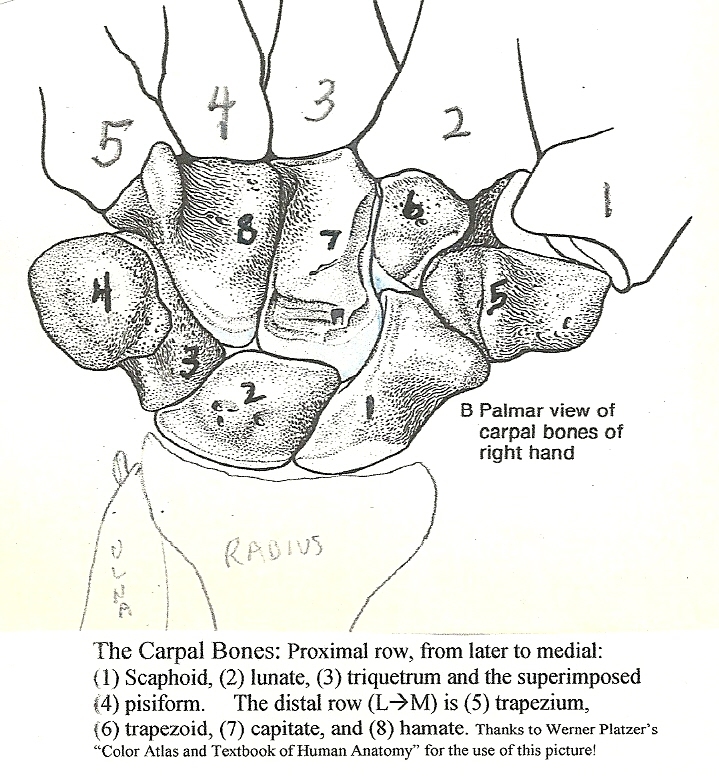 The scaphoid is the farthest lateral of the four bones in the proximal row of carpals; the lunate, second from thumb side. Scaphoid Fracture. Even slight tenderness in the anatomic snuffbox about the scaphoid and swelling obliterating the space between the thumb's extensor tendons suggest the danger of scaphoid fracture that may not appear on film for two-weeks posttrauma. Axially directed percussion on the knuckle of the patient's index finger when his fist is closed will usually elicit scaphoid pain if it is fractured. Bone necrosis and nonunion are always a danger because the bone is poorly nourished in a third of the population. Scaphoid fracture has a high incidence in ice hockey. Golfer's Wrist. If a full golf swing hits the ground or a hard object other than the ball, an isolated fracture of the wrist may result. The mechanism seems to be from violent contraction of the flexor carpi ulnaris insertion through the pisiform-hamate ligament. Roentgenography may show a fracture of the hamate. Boxer's Wrist (Lunate Injury). Carpal dislocations, especially lunate and paralunate, are frequently missed during evaluation. These are often associated with a trans-scaphoid fracture and necrosis. Lunate dislocation and/or fracture may be seen in any athlete from a fall on the outstretched hand, but it is most common in boxers whose hands are carelessly wrapped. Damage to the median nerve is a complication. The clinical picture is one of anterior wrist swelling, with stiff and semiflexed fingers. The lunate usually dislodges posteriorly or anteriorly, disrupting its relationship with the neighboring carpals and the distal radius. Anterior displacement is the common direction, where the bone rests deep in the annular ligament and may affect the median nerve. The lunate is loosely stabilized by an anterior and posterior ligament that contains small nutritive blood vessels. A torn ligament thus interferes with the lunate's nutrition, resulting in necrosis. On a P-A view, the lunate's normal quadrilateral shape becomes triangular, and the third metacarpal and capitate usually move proximally. With paralunate dislocation, the lunate retains normal alignment with the radius but the distal carpals become displaced from their normal position with associated changes in intercarpal joint spaces. Wrist strength in flexion is nearly double that in extension, and the power of extension is greatly lessened when the wrist is fully flexed. During extreme flexion of the wrist, it is impossible to strongly curl the fingers in full flexion because the flexor tendons are slack. When the wrist is hyperextended, the extensors relax and the fingers cannot hyperextend fully. And because the A-P curve of the proximal carpals is more acute than the transverse curve, greater excursion is allowed in wrist flexion and extension than in lateral motion. However, the exact degree of wrist motion varies considerably from patient to patient. It appears that the more delicate the bone structure, the greater the mobility. Because they are loosely connected, the navicular and trapezium spread during wrist abduction and approximate during adduction. These are important considerations when the wrist is examined. The muscles of the wrist course obliquely to the parts to be moved, and this requires coordination with other muscles whenever the wrist is moved. The carpals articulate with the ulna only during extreme wrist abduction. The distal radius enlarges to form the seat of the articulation of the proximal row of carpals. The radial facet is concave and sheathed with a triangular cartilage. The distal row of carpals forms a complex joint with the proximal row. The volar surfaces of the carpals present eminences that serve as attachment points, allowing increased mechanical advantage for the muscles and ligaments of the hand. They also guide tendon passages. The proximal carpals rock and glide toward the ulnar during wrist abduction and toward the radius during adduction. Adduction is slightly greater in pronation because the styloid process of the ulna restricts motion when the hand is supinated. During adduction, the styloid swings backward out of the way. The convexity of the transverse proximal carpal surface is sharper than the concavity of the radioulnar surfaces to afford a good range of joint motion. The abstruse architecture of the wrist allows highly synchronized flexion, extension, radial deviation, ulnar deviation, and supination and pronation of the forearm. Active flexion, extension, ulnar deviation, and radial deviation are tested simply by having the patient flex and extend the wrist, then deviating the wrist medially and laterally. Supination and pronation tests have been described previously with the forearm. The wrist complex is far more than eight bones arranged in two horizontal rows between the forearm and hand. Three vertical columns must also be considered. The wrist is essentially a biaxial complex of joints that is capable of motion in two planes: (1) radial and ulnar deviation and (2) palmar flexion and extension. Rotation is slight but important to healthy function. The patterns of movement between the two horizontal carpal rows are reciprocal to each other. In radial deviation (about 15 degrees), the distal row moves toward the radius, while the proximal row moves toward the ulnar. In ulnar deviation (about 35 degrees), these movements are reversed; ie, the distal row moves ulnarly, while the proximal row moves radially. Extension. Wrist extension is controlled by the extensor carpi radialis longus, extensor carpi radialis brevis, and extensor carpi ulnaris. Strength is tested by having the examiner stabilize the patient's forearm by firmly grasping the patient's wrist with one hand and applying increasing flexion pressure against the dorsum of the patient's hand after motion has reached maximum extension. See Table 1. Flexion. Flexion of the wrist is provided by the flexor carpi radialisI and flexor carpi ulnaris. To judge strength, the patient makes a fist, the examiner stabilizes the wrist, and the patient flexes the closed fist. At the end of flexion, the examiner applies increasing extension resistance to the patient's fist with the active hand. Wrist supination and pronation strength has been discussed previously with the elbow. Refer to Monograph 17. Contusions and Related Conditions. The lateral forearm is a favorite weapon in many contact sports. Contusions, abrasions, lacerations, and bone bruises are common, but fractures are not. Forearm bruises are quite painful and exhibit functional weakness, but they respond quickly to standard care. Precautions against myositis ossificans should always be made. Management. Treat with cold, compression, and elevation regardless of initial appearance. Swelling in the athlete is often hidden within well-developed forearm muscles. Rest in a sling for 1-2 days, diathermy, ultrasound, and massage are helpful after the acute stage. Protective padding should be applied during competitive activity for 2-3 weeks. Nonacute subperiosteal hematoma responds well to diathermy and ultrasound. As in traumatic inflammation of the elbow, the most common forearm strain is the result of forced supination or pronation against resistance. Direct blows and falls are also common causes. Ulnar neurapraxia may be a complication. Trigger points are commonly found just below the antecubital crease, over the heads of the proximal radius and ulnar. It was explained previously how specific points of tenderness may reveal pertinent diagnostic evidence. For example, tenderness over the medial collateral ligament as it arises from the medial epicondyle is a sign of valgus sprain. Muscle tenderness in the wrist flexor-extensor group is characteristic of flexor-pronator strain. The innervation and major functions of the primary muscles of the forearm are shown in Table 2. Roentgenography. In severe wrist sprains, radiographs should be taken of the wrist, elbow, shoulder, and possibly the upper thorax. In a fall on the outstretched hand, for example, all joints in the kinematic chain become involved. Injury to the proximal radioulnar articular by sudden wrist overpronation or excessive supination frequently occurs. Management. During the acute stage, structural alignment, cold, compression, strapping, positive galvanism, rest and possibly elevation are indicated. After 48 hours, passive congestion may be managed by contrast baths, light massage, gentle passive manipulation, sinusoidal stimulation, and a mild range of exercise initiated. Vitamin C and manganese glycerophosphate are advised throughout treatment of most any sprain. During consolidation, local moderate heat, active exercise, mobilization, and ultrasound are beneficial. In the stage of fibroblastic activity, deep heat and massage, vigorous active exercise, ultrasound, and active joint manipulation speed recovery and inhibit postinjury effects. Contributing fixations will likely be found at C5-T1. Also release fixations found at the nonacute elbow, shoulder, or wrist. After relaxing the tissues and adjusting the subluxated/fixated segments, it's helpful to apply deep high-velocity percussion spondylotherapy over segments C7-T4 for 3-4 minutes. Treat trigger points discovered, especially those found in the anconeus, biceps, triceps, brachialis, brachioradialis, and extensor and pronator muscles. Supplemental nutrients B1, C, RNA, calcium, and magnesium are recommended. Other beneficial treatment includes cryotherapy and massage with eucalyptus oil in the early stage, followed by spray and stretch, and tendon friction massage of involved muscles. Helpful modalities during rehabilitation are moist heat or shortwave diathermy, ultrasound for heat and massage at the cellular level, hot needle-spray showers, interferential therapy, iontophoresis or phonophoresis with proteolytic enzymes, local vibration-percussion, alternating current, or high-voltage therapy. Never apply tape completely around the anterior wrist. An arm sling may be necessary in the early stage to rest affected tissues and enhance healing. After the acute stage, the attending physician should demonstrate progressive therapeutic exercises to strengthen weakened muscles and/or stretch contractures. An associated injury to the brachialis anticus muscle resulting in contracture is seen with many forearm strains. Avulsion-type injuries have sharp point tenderness at the site of tendon or ligament attachment. In children, a strip of periosteum may be torn from the anterior humerus. This will be followed by a callus and restricted joint motion. Local myositis ossificans may also develop in the tendon of the brachialis anticus. Myositis ossificans following brachialis strain may develop in the brachialis anticus tendon. This is often the result of recurrent bruising and bleeding, which are usually preventable by proper padding. Initial management, similar to that for supraspinatus calcification, should be followed by progressive passive and active exercises to return limb mobility to normal. (4) deep axillary abscess, in which an insidious painful septic focus may burrow so deeply in the axilla that edema of the arm, as well as pain, is produced. Leukocytosis and slight fever accompany it. The cause of the edema is usually brought out by the general physical examination of the heart, local lesions, urinalysis, etc. Manifestation of a subclinical entity may be precipitated by trauma or prolonged accumulating overstress. Forearm extensor muscles often exhibit tenosynovitis of traumatic origin. Features include pain along the dorsal forearm, crepitus along the extensor tendons, swelling (palpable and visible), and possibly hypertrophy of the extensors and abductors of the thumb. The forearm's extensor muscles are often affected in racket-sport players, oarsmen, and canoeists. Management. Treat as a severe strain with rest, anterior crisscross strapping with the elbow almost flexed to a right angle, and anti-inflammatory measures. A proximal radial or ulnar subluxation is sometimes involved. Referral for fasciectomy and paratendon excision may be necessary in stubborn cases. Stenosing tenosynovitis is invariably caused by repetitive overstress or direct trauma. This painful condition is predisposed by the relative narrowness of the common tendon sheaths of the abductor pollicis brevis and longis. The incidence is highest in prolonged repetitive thumb pressure such as in racket and paddle sports, golf, bowling, and knitting, and sometimes it results from clipping hedges or piano playing. Repetitive wrist and thumb overstress produces pain along the distal radius that is increased by thumb motion. Chronic irritation causes the thumb's extension tendons to become inflamed as they pass through the narrow tunnel on the lateral wrist. Tendon thickening can be felt on the dorsum of the hand at the base of the thumb. Finkelstein's Test. The patient is asked to make a fist with the thumb tucked inside the palm. Stabilize the patient's distal forearm with one hand, and ulnar deviate the wrist with your other hand. Sharp pain induced in the area of the first wrist tunnel (radial side) strongly points toward de Quervain's disease. If conservative management fails, referral for pain relief, corticosteroids, and possible surgical release should be considered. Surgery is usually required to free a strong binding. Distinct syndromes such as de Quervain's disease, trigger finger, or extensor carpi radialis tenosynovitis are typically involved depending on the specific site of the lesion. After cerebral lesions involving the arm motor center and in almost any spinal or peripheral nerve lesion that involves one set of muscles and spares another, healthy muscles contract (or overact) and permanent deformities result. Similar contractures occur in trauma-related hysteria. Locating contractures has little diagnostic value, but their presence indicates a late and stubborn stage of an associated neuromuscular lesion. Raynaud's phenomenon is a vasomotor disturbance manifesting in the digits (upper limb or lower limb, rarely both). The patient is asymptomatic between attacks. It often precedes the development of rheumatoid arthritis or scleroderma. It is also linked to peripheral vascular disease, thoracic outlet syndrome, pulmonary hypertension, myxedema, poisoning (ergot, carbon monoxide), and trauma (eg, frostbite). Young adult females (18-30 years of age) have the highest incidence. This episodic disorder (usually bilateral) features intermittent attacks of digital pallor (reflex vasospasm) followed by cyanosis and then redness (reflex vasodilation) before returning to normal. Sensations of throbbing, numbness, or tingling are also common during an attack, but the radial and ulnar pulses remain normal. Exposure to cold or emotional stress often precipitates an attack. Infrequently, untreated cases progress to gangrene of the fingertips. Management. It is the author's experience that associated spinal majors will likely be found at C7-T1 and 1st rib. Also release fixations found in the fingers, wrist, elbow, shoulder, shoulder girdle, and anterior thorax. After relaxing the tissues and adjusting the subluxated/fixated segments, apply deep high-velocity percussion spondylotherapy over segments C7-T4 for 3-4 minutes. Treat trigger points found, especially those in the neck, rhomboids, and upper-thoracic multifidi muscles. Supplemental nutrients B12, niacin, folic acid, pangamic acid, and calcium are recommended by authorities. Counsel the patient to avoid appropriate antivitamin and antimineral factors, especially nicotine and other vasoconstrictors. Other helpful forms of treatment include spray-and-stretch therapy for trigger points, shortwave diathermy of the trunk, paraspinal ultrasound, pulsating alternating current for passive exercise, or interferential therapy. Temporary TENS is often beneficial in situations of intractable pain. Demonstrate progressive aerobic therapeutic exercises to strengthen weak muscles and/or stretch contractures. Inform the patient that vigorous circumducting exercise of the upper extremity may stop an impending attack. Encourage warm bromine-valerian baths and the avoidance of stimulating showers. Rapid atrophy occurs in all types of neuritis, as well as in poliomyelitis and progressive muscular atrophy. In the latter, it occurs without complete paralysis, though the wasted muscles are, of course, weak. Progressive muscular atrophy usually begins in the muscles at the base of the thumb and between it and the index finger. Less often, the process begins in the deltoid. In either case, the remaining arm muscles are involved later. In the atrophies just mentioned, a lack of the trophic (nourishing) functions is assumed to explain the wasting. From this, we can distinguish atrophy due simply to disuse of the muscles without nerve lesions. Slow atrophy of disuse occurs in the arm and hand in hemiplegia, infantile or adult, and in other cerebral lesions involving the arm/hand center or the fibers leading downward from it. Cervical-rib syndromes occasionally lead to wasting as well as pain in the corresponding arm. The atrophy often seen in hysterical cases is probably due to disuse and is similar to that occurring in an arm that has been splinted after fracture or dislocation. This upper-extremity vasomotor reflex spasm leads to osteodystrophy and bone resorption. It is unusual in that the associated pain is out of proportion to clinical findings. A periarticular inflammatory reaction is involved that spreads to underlying bone. Trauma is often in the history. Symptomatology. Related features include hand and finger pain, paresthesia, swelling, stiffness, intolerance to cold, tenderness, limb trigger-point development, and decreased joint motion. Skin color and texture changes, nail ridges, hyperhidrosis, and local temperature changes are often associated. Physical Diagnosis. After conducting a standard physical examination, motion palpate the spine, and relate findings with the patient's complaints. Confirm findings with appropriate orthopedic and neurologic tests. Check pertinent tendon and superficial reflexes, and grade the reaction. Check involved and adjacent joint motion and muscle strength against resistance, and grade resistance strength. Interpret resisted motion signs, and test for autonomic imbalance. Diagnosis is confirmed by roentgenography, but this is only possible in the advanced stage. Management. Associated majors will likely be found at the wrist, elbow. C6-T1, and 1st rib. Also release fixations found in the fingers, shoulder, shoulder girdle, and anterior thorax. After relaxing the tissues and adjusting the subluxated-fixated segments, apply deep high-velocity percussion spondylotherapy over segments C7-T4 for 3-4 minutes. Treat trigger points discovered, especially those found in the deltoid, wrist extensors, subscapularis, sternocleidomastoideus, upper trapezius, rhomboids, and upper- thoracic multifidi muscles. Supplemental nutrients B12, E, niacin, potassium, and calcium are recommended. Counsel the patient to avoid appropriate antivitamin and antimineral factors. As with any sympathicotonic disorder, nicotine and antihistamines should be avoided. Other helpful forms of therapy include treatment of trigger points, shortwave diathermy of the trunk, local and paraspinal ultrasound, pulsating alternating current for passive exercise, or interferential therapy. Temporary TENS is often helpful in situations of intractable pain. Cold should be avoided. Demonstrate therapeutic exercises to strengthen weak muscles and/or stretch contractures. Trauma of the wrist should never be taken lightly. An improperly diagnosed and treated case can readily lead to severe arthritis. Good management rests on a thorough knowledge of the underlying anatomy of the carpal bones and fibrocartilage complex. The muscles acting on the wrist and their function and innervation are shown in Table 3. Move the patient's relaxed wrist into flexion and extension. If pain is induced, wrist fracture, subluxation, sprain, acute tendinitis, or an underlying pathology is suggested. If negative, repeat the movements against patient resistance. Induced pain then points to wrist strain, rupture, acute or chronic tendinitis, or pathology. Radial Stress Sign. Pain over the medial aspect of the wrist is produced when the wrist is passively forced into radial deviation. The sign is positive in posttraumatic disorders or pathology at the medial aspect of the wrist. Ulnar Stress Sign. Pain arises over the lateral aspect of the wrist when the patient's wrist is forced into ulnar deviation, indicating posttraumatic effects or pathology at the lateral aspect of the wrist. Wrist sprain is quite common and may be associated with fractures and dislocations of the carpals, elbow, or shoulder girdle. Thus, all severe wrist joint injuries should include roentgenography of the elbow, shoulder girdle, and cervicothoracic spine. The symptoms of wrist sprain are the same as sprain in any other extremity joint and may be associated with tenosynovitis. The most important ligaments of the wrist are the volar and intercapsular groups. The weaker dorsal ligaments are arranged in laminar bands. As the proximal carpal row lack tendon support, the integrity of the volar ligament intracapsular supporting system is necessary for full function. On the dorsal aspect of the wrist, the scaphoid is the common carpal problem; on the ventral aspect, it is the lunate, hamate, and pisiform. Extension sprain with radial deviation is characterized by tenderness along the ulnar-metacarpal collateral ligament. Scaphoid fracture, a dangerous occurrence, is often mistaken as a sprain. Palpation of the anterior wrist is greatly hampered by the tendon bulk of the area and useless on either aspect after swelling has taken place. Dorsiflexion sprain features tenderness along the volar aspect of the wrist and distal radius. In either case, the pain is less than that of fracture, and crepitus is absent. Management. During the acute stage, structural normalization, cold, compression, strapping, positive galvanism, rest, and possibly elevation are usually indicated. Never apply tape completely around the anterior wrist. After 48--72 hours, passive congestion may be managed by contrast baths, light massage, interferential therapy, gentle passive manipulation, galvanism, sinusoidal stimulation, or ultrasound, along with a mild range of exercise initiated. Vitamin C and manganese glycerophosphate are reported to be advisable throughout treatment of most any sprain. During consolidation, local moderate heat (eg, pulsed diathermy), active exercise, mobilization, and underwater ultrasound are beneficial. In the stage of fibroblastic activity, deep heat followed by transverse friction massage, vigorous active exercise, ultrasound, and active joint manipulation speeds recovery and inhibits postinjury effects. Kienbock's disease is a slow progressive disorder of the lunate, sometimes discovered following wrist injuries. The disorder is generally thought to be caused by interference with the blood supply (avascular necrosis) from dislocation with spontaneous replacement. The clinical picture is a rarefaction-type osteitis, similar to that of Kummell's disease, with symptoms of pain on use, tenderness, swelling, and especially limited dorsiflexion. A similar disorder to Kienbock's disease that involves the scaphoid (navicular) bone of the wrist is sometimes called Preiser's disease. Finsterer's Test. This is a two-phase test for Kienbock's disease: (1) If the normal prominence of the middle knuckle during clenching the fist firmly is not produced, the test is initially positive. (2) If percussion of the 3rd metacarpal just distal to the dorsal aspect of the midpoint of the wrist elicits abnormal tenderness, the sign is confirmed. Management. Prolonged immobilization (eg, casting for several months) and the standard treatment for severe sprain are indicated. The cast should be constructed so that it can be removed daily to allow for range of motion exercises of the wrist. Infrequently, referral for excision of the bone or arthrodesis may be necessary. Sometimes a bone bruise is found deep in the proximal hypothenar eminence in the hamate-pisiform area. This affliction is common to sports requiring a hand-held object such as a hockey stick, ski pole, bat, or racket due to impact on the hamate prominence. It may also result from a fall when the outstretched hand strikes an irregular surface. It was common among pioneer chiropractors who used a pisiform contact and dynamic recoil technic exclusively. Chronic aggravation results in deep swelling, carpal-tunnel-like vascular symptoms, and distal neuralgia. Management. When severe, initial treatment must be quick to minimize bleeding and swelling through cold, compression, elevation, and rest. Padding, often specially designed, must be worn as long as tenderness persists. During recovery, corrective manipulation, interferential therapy, local heat, ultrasound, or massage may be applied to relieve related soreness; however, rest and careful padding are generally considered the priority therapy. The greatest problem in management is convincing the patient to protest and rest the area after initial tenderness fades. Repeated injury leads to arthritis and medial tunnel syndromes. As described in a previous chapter, a ganglion is a cystic swelling occurring in association with a joint or tendon sheath apparently formed as a defense mechanism when the wrist is repeatedly twisted and strained. It has a fibrous outer coat and an inner synovial layer containing a thick gelatinous or mucinous fluid. A stalk can frequently be traced during surgery to a joint or tendon sheath. The most common site is in the wrist or dorsum of the hand, but it is sometimes found in the ankle or foot. It may be found almost anywhere in the body near a joint or tendon sheath. A firm localized swelling and possibly weakened grip strength manifest. Aching or sometimes pain from pressure on adjacent structures may arise. The exact cause is unknown. With children, ganglia tend to spontaneously subside. Management. Referral for puncture, excision, or aspiration (followed by a pressure bandage for 2--3 days) is generally recommended. Rehabilitation procedures commonly include underwater ultrasound, interferential therapy, and whirlpools. This is the most common nerve entrapment syndrome of the wrist. Nevertheless, its diagnosis today is almost a fad, misdiagnosis by allopaths is common because they restrict the cause to be local. It is paradoxical that a last-resort surgical treatment is severing the autonomic supply to the involved forearm(s) but the cause is not sought in the upper thoracic spine, where the focal point) frequently exists. This is not to say that wrist origins are not involved in true carpal tunnel syndrome. It is difficult to injure any of the flexors on the anteromedial aspect of the wrist without damaging the median nerve in this area. Keep in mind that neurologic, vasomotor, or vascular interference at the spine, thoracic outlet, shoulder, or elbow is just as frequent a cause that can exhibit symptoms only in the hand and fingers. In wrist lesions, the cause can be any local or systemic disorder narrowing or crowding the carpal tunnel. This narrowing is said to be five times more prevalent in women than men. The characteristics of the syndrome are pain, grip and supination weakness, tender wrist transverse ligaments, volar swelling at the wrist, numbness, and burning or tingling in the first two or three digits and/or the area proximal to the wrist. Symptoms usually appear distal to the lesion, but they also may radiate upward, possibly as far as the neck. Pain often wakes the sleeping patient. It is relieved by hanging the involved arm toward the floor while prone. Light touch, temperature, and position perception are diminished or absent. Phalen's test (hyperextension of the wrist) aggravates symptoms. Thenar atrophy, anesthesia of the lateral fingers, inhibited forearm pronation and supination, and a "flat-hand" deformity manifest when the disorder becomes chronic. A neuroma may form proximally to the tunnel. Venous engorgement and a bulge may be seen in the flexor mass of the distal wrist. This is similar to that seen in muscle hypertrophy or tenosynovitis. Note that impairment of the radial or ulna arteries also exhibit similar features. The history may reveal a scaphoid fracture, paralunar dislocation, or bout of wrist tendinitis. The patient may describe a sudden fall that was stopped abruptly by the palm of the hand when the wrist was acutely dorsiflexed. Repetitive microtrauma from long hours of wrist manipulation such as in typing or playing computer games is another precipitating factor that has had a rising incidence in recent years. Referral for surgical decompression may be necessary if conservative treatment fails. Surgery, however, is not always successful. Diagnosis. In carpal tunnel syndrome, supination weakness that improves when the radius and ulnar are compressed distally is confirmation that also shows a radioulnar separation subluxation exists. Aside from standard diagnostic procedures, test for autonomic imbalance if suspicions of vagotonia or sympathicotonia arise, and they often will with this syndrome. Management. Associated spinal majors will likely be found at C6-T1 and 1st rib. Release fixations found in the fingers, wrist, elbow, shoulder, and shoulder girdle. After relaxing the tissues and adjusting the subluxated and/or fixated segments, apply deep low-velocity percussion spondylotherapy over segments C7-T4 for 1-2 minutes. Treat trigger points discovered, especially those found in the wrist flexors and extensors, forearm supinators, subscapularis, infraspinatus, and upper trapezius and latissimus dorsi muscles. Supplemental nutrients B6, C, niacin, and rutin are recommended by some authorities. Counsel the patient to avoid appropriate antivitamin factors. Other helpful forms of treatment include rest, anti-inflammatory therapy, and spray-and-stretch therapy for trigger points during the acute stage, followed by moist heat or pulsed diathermy, warm whirlpool hand baths, iontophoresis with niacin, mild alternating current for passive exercise, or tendon friction massage of involved muscles (except in the elderly). After the acute stage has passed, demonstrate therapeutic exercises to strengthen weak muscles and/or stretch contractures throughout the upper extremities and cervicothoracic spine. During a severe attack, temporary immobilization of the wrist in the neutral position may be necessary to relieve the pain. Anything that might impair the circulation of the hand must be avoided (eg, tight wrist watch strap, bracelet, elastic bandage, tight shirt or blouse cuffs, etc). The symptoms of wrist arthritis are typical of trauma: tenderness, painful motion, swelling, and possibly superficial warmth overlying injured tissues. Fixation is produced. A priority is to differentiate traumatic from infectious inflammation of the wrist or hand. Traumatic arthritis of the wrist usually has a clear history of severe sprain, strain, fracture (especially scaphoid) or dislocation of the carpals (especially lunate). Physical signs and symptoms are often misleading. Roentgenography is required for diagnosis. Management. Associated spinal majors will likely be found at C6-T1 and 1st rib. Also release fixations found in the fingers, wrist, elbow, shoulder, and shoulder girdle. Temporarily avoid further stress or stimulation of the involved acute joints. After relaxing the tissues and adjusting the subluxated and/or fixated segments, apply deep high-velocity percussion spondylotherapy over segments C7-T4 for 3-4 minutes. Treat trigger points discovered, especially those found in the wrist flexors and extensors, subscapularis, infraspinatus, upper trapezius, and latissimus dorsi muscles. Supplemental nutrients B-complex, C, niacin, pantothenic acid, and zinc are often recommended. Counsel the patient to avoid appropriate antivitamin and antimineral factors. Other helpful forms of treatment include rest, temporary support, comfrey ointment, cryotherapy, and spray-and-stretch therapy for trigger points during the acute stage, followed by moist heat or shortwave diathermy, warm whirlpool hand baths, ultrasound in water, interferential therapy, pulsating alternating current for passive exercise, or high-voltage therapy in water. After the acute stage has passed, demonstrate therapeutic exercises to strengthen weak muscles and/or stretch contractures. Degenerative joint disease is characterized by deterioration and abrasion of articular cartilage with new bone formation at the borders of the articulation. It is the most common form of arthritis and found in all mammals, foul, and fish. Wear of aging, trauma, and the abuse of weight bearing is usually attributed, but this seems an oversimplification for the disruption of collagen, decreased ground substance, many microscopic changes, and frequent increase in water content of the involved cartilage. A vasomotor trophic deficit is likely involved. Symptomatology. Morning stiffness that eases with activity, pain on prolonged exercise, slight joint swelling from fluid accumulation, crepitus on movement, disuse atrophy, and joint deformity are characteristic. Management. If a cause can be found, it must be removed. Associated spinal majors will likely be found at C1, C5-T1, and T11-L2. Release unankylosed fixations found in the fingers, wrist, elbow, shoulder, and shoulder girdle. After relaxing the tissues and adjusting the unankylosed subluxated and/or fixated segments, apply deep low-velocity percussion spondylotherapy over segments C7-T4 and T11-L2 for 1-2 minutes. Treat trigger points discovered, especially those found in the wrist flexors and extensors, upper trapezius, and latissimus dorsi muscles. Supplemental nutrients A, B-complex, C, D, rutin, and sulfur are recommended by several authorities. The diet should be rich in fiber. Counsel the patient to avoid appropriate antivitamin and antimineral factors. Some nutritionists recommend honey, apple cider vinegar, ginger ale, and ginger tea in the patient's diet. Other helpful forms of treatment include spray-and-stretch therapy for trigger points, moist heat or shortwave diathermy, warm whirlpool hand baths, hydroultrasound, interferential therapy, alternating current for passive exercise, or high-voltage therapy. After the acute stage has passed, demonstrate therapeutic exercises to strengthen weak muscles and/or stretch contractures. Rheumatoid arthritis is not considered to have a traumatic origin. However, the noxious effects that overstress (traumatic or emotional) has on the immune system can easily precipitate the disorder. It seems that rheumatoid arthritis always has some precipitating component of psychic overstress. Rheumatoid arthritis is a chronic inflammatory disease of systemic origin that chiefly affects joint synovia initially. The direct cause is unknown, but it is generally classified as a defect in the autoimmune system. Granulomas develop in periarticular tissues. They also are found in the dura matter, myocardium, heart valves, lungs, eyes, somatic muscles, and peripheral nerves. The hands are often the first parts of the body to manifest this syndrome: first the metacarpophalangeal joints, next the proximal interphalangeal joints, then the bones of the wrist. Deformity occurs late in the disease, involving joint architecture (bone erosion and cystic changes) and changes in tendons, muscles, and ligaments. Early symptoms are myalgia and morning stiffness aggravated by motion. Joint swelling, tenderness, and limited motion are common. Late features are pain at rest increased by motion, disability, and subluxation leading to ankylosis and deformity. It has been the author's experience that, if recognized early, this disorder can often be resolved in 5-7 weeks but long-term maintenance care 3-4 times a year is recommended. Once deformity has occurred, the best that can be expected is to retard the progress. In some cases, joint function improves greatly even if deformity remains. Cervical osteoarthritis or rheumatoid arthritis of the wrist may refer pain to the elbow, as can shoulder pathology. Symptoms may be referred to the wrist or hand from the cervical spine, shoulder, or elbow such as from cervical disc disorders, osteoarthritis, brachial plexus syndromes, shoulder and elbow entrapments. Gout may arise spontaneously when the kidneys fail to adequately remove uric compounds from the blood. The direct cause of this renal failure may be metabolic or local renal dysfunction. At times, it is hastened by trauma, either physical injury or emotional overstress (eg, death in the family). Homeostasis can be disturbed equally severe by intrinsic or extrinsic trauma. Gouty arthritis is the effect of hyperuricemia depositing monosodium urates in distal tissues (fingers, toes). Movement upon the jagged crystals creates an acute inflammatory reaction. When prolonged, gout is usually overlaid with rheumatoid arthritis, suggesting that an immunologic factor as well as a purine metabolism defect is involved. Involved joint(s) become swollen and excruciatingly painful in episodes of varying duration. The overlying skin becomes hot, deep red, and shiny. Emotional overstress, fatigue, overindulgence, or drugs may precipitate an attack. No position affords relief. Primary treatment must be directed at the cause of the hyperuricemia. Percussion of a nerve above or below a point of complete severance normally elicits no subjective sensations. In cases of partial severance or in cases of compression of this given peripheral nerve where some conduction is preserved, percussion distal to the involvement brings out a tingling paresthesia below the point of tapping. This represents a positive Tinel's sign. A positive sign also indicates nerve regeneration if it is elicited over a nerve that had previously been negative on percussion. In this respect, it has prognostic as well as diagnostic value. The history and mode of onset; the frequent association of sensory symptoms that do not fit the distribution of any peripheral nerve, spinal segment, or cortical area; the normal reflexes; and the electrical reactions distinguish most cases of hysteria. But sometimes diagnosis is most difficult. In addition to causes such as wounds and lacerations, the radial nerve may be damaged by fracture of the middle third of the humerus, by pressure from a crutch in the axilla, or from the arm hanging over a bench, table, or some similar object during unconsciousness. The outstanding symptom is classic "wrist drop." The thumb cannot be abducted (pollicis longus and brevis paralysis), finger flexion is impaired, and the wrist cannot be extended against moderate resistance. When the nerve is actually severed or "caught," surgical correction is usually required. The nerve supplies sensory fibers to the dorsum of the hand on the radial aspect, especially at the web between the thumb and index finger. Wrist Drop Test. The patient's two opposing palms are placed together with the hands in dorsiflexion. On separation, failure to maintain dorsiflexion is a positive sign and significant of radial nerve impairment. In trauma of the anterior wrist, sensation and motion of the fingers should be carefully studied. The median nerve supplies sensory fibers to the radial aspect of the palm and the palmar surfaces of the thumb and first two fingers, but it is sensory purest on the palmar surface of the tip of the index finger. Motor function of the distal branches of the medial nerve is screened by determining the strength of the thenar muscles. It is difficult to injure any of the flexors of the medial anterior wrist without damaging the median nerve. When severely bruised, a classic "flat hand" deformity results. Median nerve paresthesias may have their cause in the cervical spine, but they are just as common from interference at the thoracic outlet, shoulder, elbow, or wrist. Correction must be directed to where the interference is located and not where it "should be" located. Ochsner's Sign. When clasping the hands so that the fingers intertwine, the index finger fails to flex when Ochsner's sign exists. This sign is significant of a median nerve lesion affecting the flexor digitorum superficialis muscle. Wartenberg's (Oriental Prayer) Sign. The patient is instructed to spread the hands out so that the palms face downward (the fingers are extended and the thumbs are adducted) then to raise the hands toward the face so that the palms appose. If the index fingers touch but the thumbs do not meet, paralysis of the abductor pollicis brevis is likely. Finger Count Test. The median nerve can be tested by asking the patient to touch each finger with the thumb. Remember that the median nerve is under the transverse carpal ligament. Ulnar compression syndrome features entrapment, usually in the canal of Guyon. Entrapment may be of the superficial or the deep branch of the ulnar nerve, but the superficial branch is rarely affected by itself. The pisiform-hamate tunnel syndrome is similar to but less frequent than that of carpal tunnel syndrome. Ulnar entrapment as the result of chronic pressure or injury at the posterior aspect of the elbow is more common than entrapment at the wrist. Clinical Features. Entrapment of the deep branch of the ulnar nerve produces a motor loss exhibited by a weak pinch, weak finger spread against resistance, deficit in actively flexing the metacarpophalangeal joints, and interosseous atrophy. Compression of the superficial branch features burning sensations in the 4th and 5th digits. The ulnar nerve supplies sensory fibers to the ulnar aspect of the hand, both dorsal and palmar surfaces, and the ring and little fingers. Deep palpation of the pisiform-hamate tunnel initiates or aggravates the pain. A hamate fracture or pisiform dislocation may be found in tangential roentgenography. Prolonged involvement features hypothenar and intrinsic motor weakness and atrophy. A delayed nerve conduction time is usually associated. Froment's (Cone) Sign. In paralysis of the ulnar nerve, there is inability to approximate the tips of the fingers to the thumb to form a cone or make an "O" with the thumb and index finger. Likewise, early palsy weakness is exhibited by the inability to firmly hold a piece of paper between the thumb and fingertips against resistance because thumb adduction strength is weakened. The Ulnar Tunnel (Triad) Syndrome. If inspection and palpation over the ulnar tunnel in the wrist determines the three signs of (1) tenderness, (2) clawing of the ring finger, and (3) hypothenar wasting, ulnar compression in the tunnel of Guyon is likely. Pain along the ulnar border of the hand may be associated. This syndrome resembles carpal tunnel syndrome except that the distribution of the ulnar nerve is involved. In stubborn cases, referral for surgical release of the ulnar tunnel should be considered. Handlebar Palsy. An overuse injury experienced by bicyclists and workers who must apply strong and prolonged grip pressure on industrial tools is occasionally seen. It is a neuropathy secondary to injury of the deep palmar branches of the ulnar nerve (handlebar palsy). The trauma results from prolonged strong pressure. The clinical picture is one of muscle weakness and wasting in the intrinsic muscles of the hands without sensory impairment. Management. The specific cause for the syndrome must be determined. During this investigation, anti-inflammatory therapy and immobilization may be applied. Goodheart states that subluxation of the hamate or pisiform toward the wrist and in the direction of the hand's dorsal aspect is a common finding. This is usually the result of a sharp blow to the pisiform area when the wrist is dorsiflexed. Adjunctive therapy is similar to that for carpal tunnel syndrome. Keep in mind that an upper thoracic subluxation complex or a 1st rib subluxation-fixation involving the sympathetic chain can mimic various wrist tunnel syndromes. Referral for exploratory surgery should be considered if neurologic symptoms fail to respond or increase after a trial of conservative therapy. Subluxated Carpal Technic. A double-thumb contact on the subluxated carpal with a thrust directed distally is usually sufficient for correction. In most cases, the mechanical correction should be supported by placing a piece of felt over the affected carpal and strapping it for about 2 weeks. As in any adjustive procedure, fracture, dislocations, and bone disease must be ruled out. In chronic states, heat is frequently necessary prior to correction to afford maximum patient relaxation and rapid physiologic response to correction. Bilateral x-ray films for comparison are helpful in diagnosis. An inferiorly subluxated radius is often a consequence of wrist sprain from a fall on the outstretched hand. Adjustment. Stand on the side of involvement, and face the supine patient. Moderately flex the patient's elbow, and be sure that it is firm against a padded table. Grasp the wrist so that your thumbs overlap at the styloid process of the lateral distal radius and your fingers cup the medial aspect of the distal ulna. Apply thumb pressure against the radius, toward the patient's elbow, and then make a short, quick, forward thrust with moderate body weight. Evaluate the brachioradialis, biceps brachii, and pronator teres. Subluxation of a carpal anteriorly is related to carpal tunnel syndrome, chronic wrist pain, extension sprain, and restricted posterior wrist flexion. The lunate is the most common carpal involved. Adjustment. Stand on the side of involvement, and face the standing or sitting patient. Grasp the patient's wrist with both hands so that a double index-finger contact is under the volar aspect of the carpal involved and the rest of your fingers supporting the other carpals. Lift the patient's forearm slightly, flex the wrist a few degrees, and place traction on the wrist. Relax the joints with mild sideward movements. The correction is made by holding firm contact pressure with your index fingers and snapping the wrist quickly into extension. Never forcibly flex the wrist as this will produce sprain. With athletes having highly developed forearms (eg, tennis pros), it may be necessary to place your knee in the patient's antecubital fossa for counterpressure. Evaluate the radius, pronator quadratus, and the extensor carpi radialis longus and brevis. Alternative Technic. Turn the involved wrist palm up. Apply overlapping thumb contact on the involved carpal, and support the patient's dorsal hand with your fingers. Apply traction, slightly flex the wrist, and make firm posteriorly-directed thumb pressure while rolling the wrist through alternated rotation, extension, flexion, and lateral flexion by describing a wide Figure 8. This subluxation is frequently associated with wrist trauma, chronic pain on motion, carpal tunnel syndrome, and restricted wrist extension. Adjustment. Stand on the side of involvement, and face the standing or sitting patient. Grasp the patient's pronated wrist with both hands so that an overlapping thumb contact is made on the involved carpal, with the rest of your fingers supporting the volar aspect of the wrist. Apply traction to the wrist, make a quick downward thumb thrust by extending your elbows while simultaneously extending the patient's wrist a few degrees. Again, it may be necessary to apply counterpressure with your knee in the patient's antecubital fossa. Evaluate the pronator quadratus and the flexor carpi radialis and ulnaris. Alternative Adjustment Procedure. This is the reverse of the alternative adjustment procedure for an anterior carpal, varied by turning the involved wrist palm down and taking thumb contact on the dorsal aspect of the carpal. A metacarpal base subluxated posteriorly is associated with pain especially increased by wrist flexion, excessive wrist flexion sprain, wrist ganglion, and restricted wrist extension. Adjustment. Stand on the side of involvement of the sitting patient. The patient's wrist should be resting on a firm pillow. Grasp the patient's involved digit with your contact hand so that your thumb rests on the proximal head of the metacarpal and your fingers wrap around the involved finger for stability. With your other hand, take a pisiform contact on top of the distal phalanx of your contact thumb. Apply moderate distal traction with your contact fingers and make a short, quick thrust downward by fully extending your elbows. As the thrust is made, the patient's wrist will dorsiflex. Evaluate the muscles of the wrist and hand. Freeing Restricted Radioulnar A-P Glide. Sit or stand facing the patient. Straighten the involved limb, and pronate the patient's forearm. Place one thumb on the most distal dorsal aspect of the radius and the other thumb on the most distal aspect of the ulna. Flex your fingers so the lateral surfaces of your respective index fingers are opposite your thumbs on the ventral side of the distal forearm. With the distal aspect of the radius and ulnar pinched between your thumbs and index fingers, slowly lift upward with one hand while pushing downward with the other and then reverse the maneuver in an alternating fashion. Freeing Restricted Radiocarpal, Ulnocarpal, Intercarpal, and Carpometacarpal Distraction, Flexion, Extension, Abduction, and Adduction Mobility. While some authorities describe specific maneuvers for correcting each of these various fixations, it has been this author's experience that they all can be corrected by using one simple procedure. The doctor-patient positions are the same as those described above with the exception that the contacts are taken approximately 1-1/2 inches more distal so that they are just beyond the last row of the carpals (over the metacarpal heads). Axial traction to patient tolerance is applied to the extended limb and the limb is slowly maneuvered through a small "Figure 8" while holding the patient's hand firm with your fingers to prevent motion of the patient's metacarpals. This maneuver produces extension, flexion, abduction, and adduction within the radiocarpal, ulnocarpal, intercarpal, and carpometacarpal articulations. Repeat 20--30 times, progressively increasing the size of the "Figure 8" to patient tolerance. This is a slow stretching maneuver, not a snapping or jerking procedure. It is common for the patient not to notice any immediate improvement but to call the next day to report a complete absence of symptoms. Closing Separated Distal Radius and Ulna. This subluxation is commonly found associated with carpal tunnel syndrome, chronic wrist pain, and the posttraumatic effects of wrist sprain. Stand on the side of involvement, and face the standing or sitting patient. Grasp the patient's semipronated wrist with both hands so that your overlapping thumbs are crossed against the lateral aspect of the distal radius and your interlaced fingers cup the medial aspect of the patient's ulna. Apply a strong squeeze with your hands to approximate the distal radius and ulnar while simultaneously making a quick downward thrust with your thumbs by extending and adducting your elbows. Opening Approximated Distal Radius and Ulna. Approximated distal radius and ulna are often found in cases of chronic wrist pain or following wrist and hand trauma. Stand on the side of involvement, and face the standing or sitting patient. Grasp the patient's pronated wrist with both hands so that your overlapping thumbs cross between the dorsal aspects of the distal radius and ulna and your interlaced fingers cup under the lower forearm. Apply a strong thumb thrust inward and outward by extending your elbows while simultaneously using your fingers to separate the distal radius and ulna. Posttraumatic exercises for the forearm are used in posttraumatic elbow, forearm, and wrist injury because of the biomechanical coupling involved. Andrews RA, Harrelson GL: Physical Rehabilitation of the Injured Athlete. Philadelphia, W.B. Saunders, 1991, Chapter 6. Beatty HG: Anatomical Adjustive Technic, ed 2. Denver, CO, published by author, 1939. Belinghausen H, Gilula LA, Young LV, Weeks PM: Post-Traumatic Palmar Carpal Subluxation. Journal of Bone & Joint Surgery, 65:998- 1006, 1983. Cailliet R: Soft Tissue Pain and Disability. Philadelphia, F.A. Davis, 1977. Chuinard RG: The Upper Extremity: Elbow, Forearm, Wrist and Hand. In Dr. Ambrosia RD: Musculoskeletal Disorders: Regional Examination and Differential Diagnosis. Philadelphia, J.B. Lippincott, 1977. Garrick JG, Webb DR: Sports Injuries: Diagnosis and Management. Philadelphia, W.B. Saunders, 1990, pp 125-142. Grilliot JR, Staines MJ: Isolated Rotary Subluxation of the Carpal Navicular. ACA Journal of Chiropractic, February 1985. Hearon KG: What You Should Know About Extremity Adjusting, ed 5. Place of publication not shown, published by author, 1981. Holmes GW, Robbins LL: Roentgen Interpretation, ed 7. Philadelphia, Lea & Febiger, 1947. Hughes T (ed): Physiotherapy Notes. Chesterfield, MO, Logan College of Chiropractic, 1984, pp 439-442. Isernhagen SJ: Work Injury: Management and Prevention. Gaithersburg, Maryland, Aspen Publishers, 1988. Janse J: Principles and Practice of Chiropractic. Lombard, Illinois, National College of Chiropractic, 1976, pp 210, 222. Maitland GD: Peripheral Manipulation. Boston, Butterworths, 1976, pp 25-51, 59-91. Mennell JMcM: Joint Pain. Boston, Little, Brown, 1964, pp 32-87. Mercier LR: Practical Orthopedics. Chicago, Year Book Medical, 1980. National Chiropractic College: Notes on Correlative Techniques. No publishing data shown. O' Donoghue DH: Treatment of Injuries to Athletes, ed 4. Philadelphia, W.B. Saunders, 1984, pp 247, 256, 244, 285, 687- 689. Schafer RC: Chiropractic Management of Extraspinal Articular Disorders. Arlington, Virginia, American Chiropractic Association, 1989, pp 214-226. Schafer RC: Chiropractic Management of Sports and Recreational Injuries, ed 2. Baltimore, Williams & Wilkins, 1986, pp 384-395. Schafer RC: Clinical Biomechanics: Musculoskeletal Actions and Reactions, ed 1. Baltimore, Williams & Wilkins, 1983, pp 670-678. Schafer RC: Clinical Chiropractic: The Management of Pain and Disability Upper Body Complaints. Huntington Beach, California, The Motion Palpation Institute, 1991, pp 185-210. Stierwalt DD: Extremity Adjusting. Davenport, IA, published by author, 1975. Stoddard A: Manual of Osteopathic Practice. New York, Harper & Row, 1969. Williams JGP, Sperryn PN (eds): Sports Medicine, ed 2. Baltimore, Williams & Wilkins, 1976, pp 387-390.